Here’s a spring blooming plant that you won’t see unless you go into the woods during early Spring, called hepatica. Hepatica americana can be found among the leaf litter beneath the trees of oak-hickory-maple forests. We see the flowers here in Pennsylvania during the last part of March through the first half of April. Hepatica is one of the Spring Ephemeral flowers, only blooming for a short time in early spring before the trees leaf out. 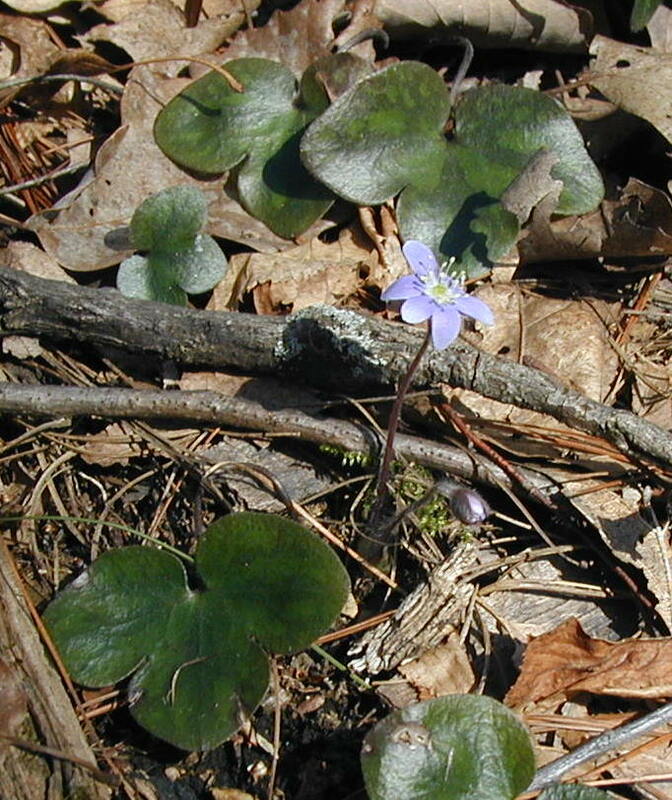 Native to forests of Eastern North America, hepatica is a perennial with some medicinal properties. The Peterson Field Guide to Medicinal Plants indicates that hepatica was highly sought after in the late 1800s for its revered ability to soothe the liver. A liver tonic craze saw tons of hepatica harvested here and abroad. A common nickname for hepatica is liverleaf. Native Americans made a leaf tea for liver and digestive ailments. Folk tradition used hepatica tea for coughs and fevers, also. We don’t harvest it for anything, we just appreciate it being there! Taking a walk in the woods, you’ll first be able to spot the dark green, shiny leaves, or the rounded edge of a leaf. Moving a few leaves aside will uncover the thick, waxy clover-shaped leaves. Round-lobed hepatica getting ready to bloom. When the leaves are new they arise in an erect posture. Once the leaves grow to full size – a couple inches or more across, the flower stem relaxes so that the large rounded leaves lie prostrate to the ground. 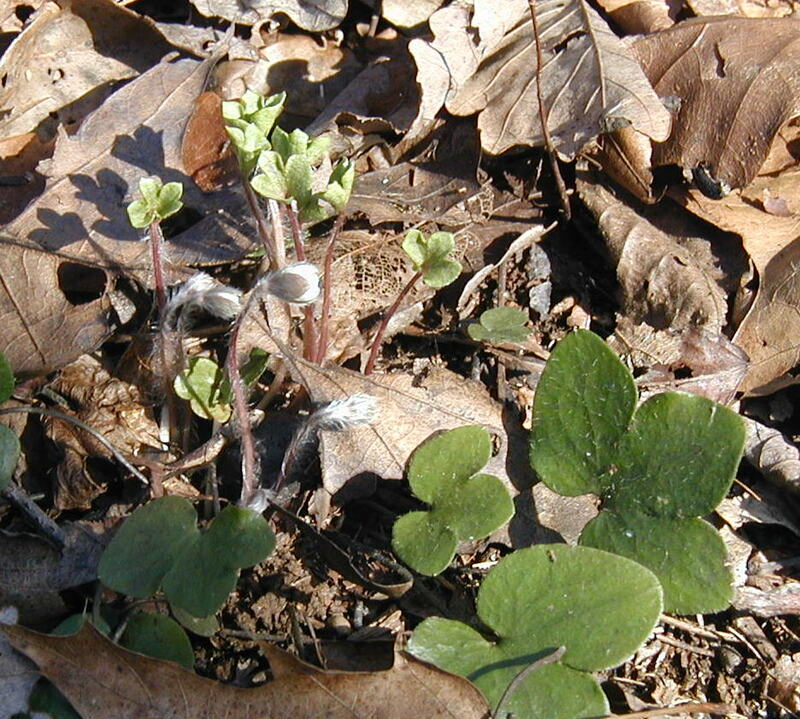 Most often you’ll see the larger, older leaves that overwinter still hiding among the leaf litter when the flowers are present. 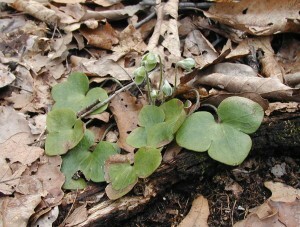 Small angular-shaped leaves of hepatica. The young leaves also have a more angular shape than the mickey mouse ears of the older leaves. Leaves and stems are fuzzy with hairs when young and lose the hairs at some point. 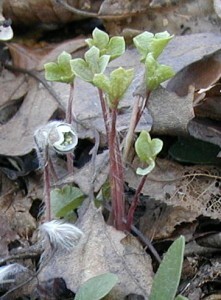 Fuzzy, hairy stalks of young leaves and flowers of hepatica. The pastel flowers sort of jump out at you when you finally see one. The purple, blue, pink or white petals are so perfect, in symmetry with the white stamens. The colorful petals are actually sepals. Green bracts underneath the flower head are rounded or pointed, depending on the kind of hepatica. Single blue hepatica flower open with round-lobed leaves. Hepatica flowers are delicate and easily beaten down by wind and rain. Truly ephemeral. 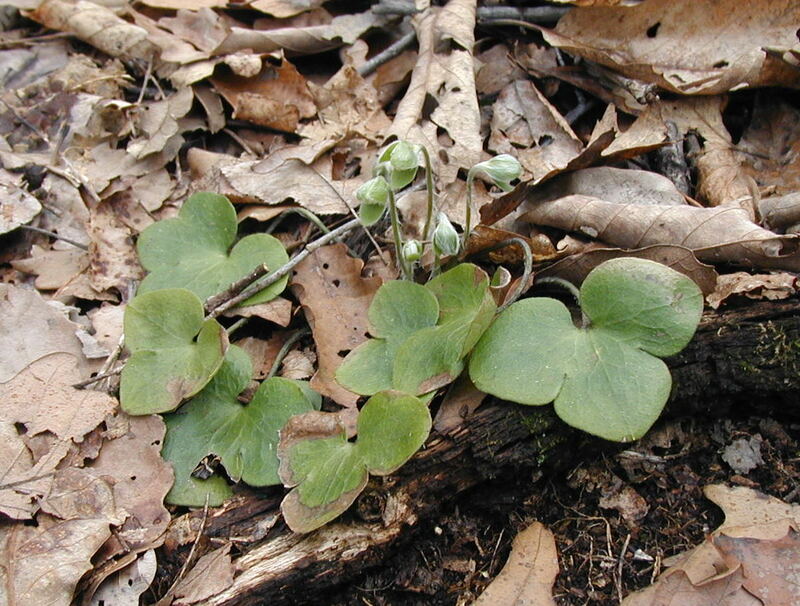 Great hepatica images from the US Forest Service. Sharp-lobed hepatica, H. acutiloba, has pointed, tri-lobed leaves and bracts. 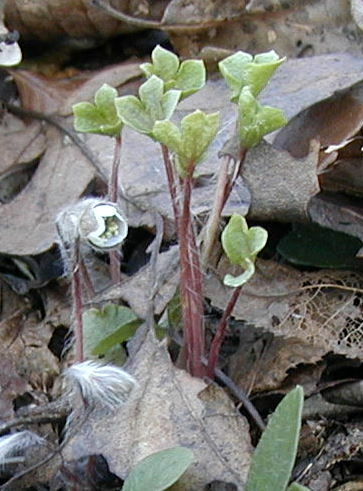 Round-lobed hepatica, H. americana, has rounded lobes on its leaves and bracts. The USDA Natural Resources Conservation Service classifies these two hepaticas as varieties of one species, Hepatica nobilus, with the sharp-lobed variety as H. nobilus var. acuta, and the round-lobed variety as H. nobilus var obtusa. In the vicinity or same microhabitat of the hepatica plants pictured here, we find downy rattlesnake plantain, a member of the Orchid family. Its perennial, cross-veined leaves are hiding among the leaf litter, but they can be found all over the north- and west-facing hillsides. At this time of the year you have to know where look for it and move leaves aside to see it. Rattlesnake plantain is easier to spot in the summertime when there is less leaf litter. After a long, hard winter and a week of very mild temperatures – in the 60s! – people are smiling again. We still have some cold and chilly weather ahead, here in the mountains of South Central Pennsylvania, but that’s ok. It’s not like we can expect more snowfalls that are measured by the foot instead of the inch! To our south the snow piled up deeper and more often, but we did enjoy the wood furnace immensely. Talk about a radiating heat that lasts…once the floor and stone heated up it carried over through the night. It is so pleasing to not burn all that petroleum oil. Sorry, Canada, but we’d rather use our reusable resource that is so plentiful in PA! Time to re-order another 3 cord of wood for next winter. Time to get to the woods to see the Spring ephemeral flowers, like hepatica, bloodroot, trout lily, violets and lots more. Check out the local parks and forests near you for places to see these beautiful Spring flowers. Your state department of conservation or forests and parks will be able to help you find a walking trail. In Pennsylvania we have the PA Department of Conservation and Natural Resources to help find a local state park.